Linpico staff were pleased to attend the Public Expenditure and Financial Accountability (PEFA) Assessors Workshop in Paris, from the 13th – 14th of December 2017, which focused on the upgraded PEFA 2016 framework. Agence Française de Développement were also in attendance. 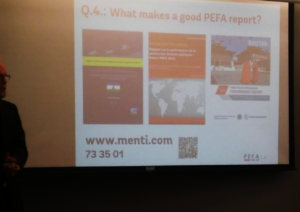 A PEFA report of Linpico’s being used as an example of high quality PEFA reporting during the training.